After enjoying Innovation, I decided that I should track down a copy of it's first expansion Echoes Of The Past. As I normally do in my expansion reviews, I will assume that you are familiar with the original game - if you're not, then please check out my Innovation Review. There are four main additions in Echoes of the Past, and so we'll simply go through them: Foreshadows, Echoes, Bonuses, and Extra Achievements. Foreshadowing is the first new concept, and is probably the "most different" from what you experience in the base game. Various new cards will give you a dogma effect that allows you to "foreshadow" a card. When you foreshadow, you take a card of the appropriate value and place it in your "foreshadow" area next to your score pile. Then, on any future turn in which you perform a meld action, you can play a foreshadowed card of value less than or equal to the card just played - and immediately perform it's dogma action. 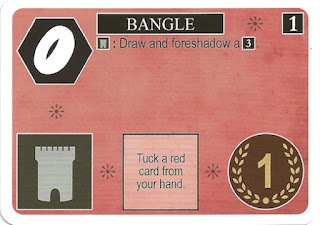 This is a neat way of stacking up extra cards and getting a nice one-two punch on turns, but in the games that I have played, this hasn't really been done especially much. The next new concept is "Echo" effects. Some of the new cards have text in the place of an icon (this is the "Echo" effect). When you perform a dogma effect for a color that is showing one or more Echo effects, these Echo effects are performed first, just like additional dogma effects - they are even shared between other players that perform your dogma effects. I like the Echo effects. I think that they can be very useful, and I like that they are balanced by the fact that Echo effects takes up an icon space, which prevents the card from being overpowered. And yet, if you have several Echo effects, you can really make certain colors incredibly powerful. 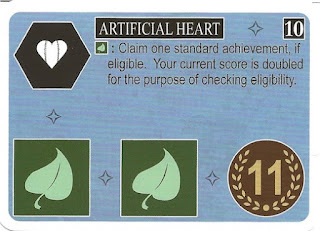 Artificial Heart has a huge bonus! The third concept is Bonuses. This is really my favorite new mechanic, though it's one of the more simple ideas. Essentially, certain cards have point values in place of an icon. This value is added to a player's total score (for purposes like determining if you can achieve). However, to keep the bonuses from growing too powerful, you only get the "full" value for your most valuable bonus, and you get one point for each of the others. So, if you have a "10", "12", "8", and "5" showing, instead of getting 35 points, you only get 15. But, this is still a nice way of getting points by melding instead of always having to find ways to add points to your score pile. Again, this is my favorite addition to the game. Now, with the primary new mechanics covered, I should mention the setup. In the basic setup (there is a variant that can be used also), you shuffle some cards from the expansion with some cards from the basic set, but the basic cards significantly outnumber the expansion cards (by the way, this makes the setup and cleanup a bit of a nuisance). Because of this, some games will have a lot more of certain new effects like foreshadowing than others - after all, some games may not even have cards that allow you to foreshadow! The thing that I really like about this new setup is that it changes the color distribution of the Ages - instead of having 2 card of each color (minus the achievement card) like in the basic game, you could actually have 4 cards of one color and none of another in a certain Age. Realizing this and trying to capitalize on this knowledge can really be helpful - especially when using dogma effects where you are guessing colors and drawing cards accordingly. Overall, I give Innovation: Echoes of the Past an 8.0/10. I didn't find it revolutionary, but I did think that the new concepts were well implemented, and added some additional variety to an already enjoyable game. If you like engaging card games like Innovation (and Echoes of the Past), you might also check out 51st State: The New Era, Friday, Glory to Rome, and Sentinels of the Multiverse. 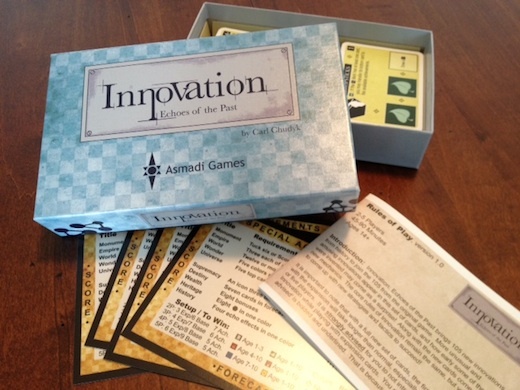 I would like to thank Asmadi Games for providing me with a review copy of Innovation: Echoes of the Past via Game Salute.